Cash Back Rewards Can Help You Save On Everyday Expenses. Tell Us How You Would Use Your Cash Back - And Win A Starbucks Gift Card. Cash Back Rewards Can Help You Save On Everyday Expenses. Tell Us How You Would Use Your Cash Back – And Win A Starbucks Gift Card. By Peter Anderson 55 Comments - The content of this website often contains affiliate links and I may be compensated if you buy through those links (at no cost to you!). Learn more about how we make money. Last edited February 10, 2014 . If you've been reading this site for a while now you probably know that I'm a big proponent of budgeting, paying cash for the things you buy, and in general not using credit in most situations. I think that so many people that are in financial dire straights right now would be so much better off if they had only planned ahead, saved up an emergency fund, and not used credit when they didn't need to. Avoiding Credit, But What About Rewards? Cash Back Rewards… From A Debit Card!? I know my advice may come a bit late for some who have already put themselves in a hole, but it's never too late to start doing things the right way. Take the time to start thinking about how you spend. While you're getting out of debt only buy the things that you absolutely need. Make a decision to no longer buy things on credit and create new debt. Only buy things on debit or with cash. Get a game plan and start getting out of debt using a plan like Dave Ramsey's 7 Baby Steps, or Crown Financial's Money Map. For some people the thought of not using their credit cards is almost unbearable because of all the rewards that they get from spending using their card. I know I've been in that boat as well, keeping one cash back rewards credit card for the last few years, and using it when spending on big things to get the cash back. Granted, I pay extremely close attention to my finances, and I only spend on my credit card when I have the cash to pay it off right away. Others, however, may not be as disciplined with their spending, and studies have shown that people end up spending in the neighborhood of 12-18% more when using their credit card. Now there is a better way to get cash back rewards, even when you're only spending money on the basics and paying with debit! You don't even need a credit card any longer! You can just open a bank account with Perkstreet Financial! Before the last year or so there really hasn't been a good way to get cash back rewards for spending your own money. The only way to get rewards was to sign up for a rewards credit card and spend a bunch of money. You could still get rewards without paying interest, but you had to be extremely careful. Now Perkstreet Financial has come out with their rewards checking account that allows you to earn rewards for spending your own money, and you can earn those rewards even on a lot of your regular bills! Here's how it works. Earn 2% cash back on all purchases for the first 3 months, regardless of balance. Earn 2% cash back after 3 months if your account balance is greater than $5000. Earn 1% cash back after 3 months if your account balance is less than $5000. 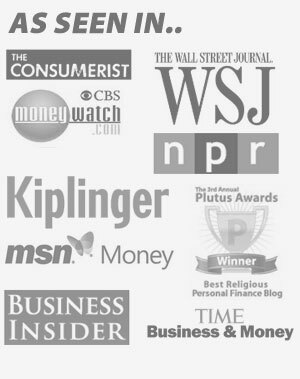 I've been working with Perkstreet Financial off and on over the past few months, writing a few articles for the Perkstreet blog and having a few interesting chats with the COO and co-founder, Jason Henrichs, a fellow Christian and Minnesotan. Through those contacts Perkstreet has reached out to me and offered to give away 10 – $10 Starbucks gift cards to Bible Money Matters readers. To make the pot even sweeter I'll also give out $25 cash via PayPal to one lucky grand prize winner in order to help fund their goals! How can you win one of the 10 gift cards or the $25 grand prize? No purchase is necessary, and you don't have to open an account with Perkstreet in order to win (although you can get bonus points for opening!). 1 Entry: Tell us in the comments how you would use the cash back that you could earn with a cash back Perkstreet account. Would you use it to pay off debt, save up for a vacation or add to your emergency fund? Let us know. 10 Entries: Open an account with Perkstreet Financial through our link and tell us about it in the comments (We can tell as our links are affiliate links – showing when an account is opened via our site). You'll earn an additional 10 entries. So it's easy to enter, just leave a comment and/or open an account! The contest will remain open until October 11th at noon central, at which time we'll choose 11 lucky winners! So let's start it up in the comments with the contest entries. How would you use your cash back rewards? With its cash back rewards, balance transfer offers and no annual or overlimit fees, Discover has a solid credit card offering. Here's a review. I’d definitely save up for family vacation. For now it’ll be used to pay down debt, but after that’s gone, it’ll likely go towards a vacation. I thought they only offered cash back in the form of music/coffee giftcards, though I haven’t checked out their accounts in a while. 2% is pretty good for a debit card! I’m always saving for something, so any extra cash goes towards one of close to ten savings goals. We did just buy a used car this weekend, so our general savings account needs a little padding. Yeah, 2% is great for a debit card, although after 3 months to continue getting that rate you have to have $5000 in the account – otherwise you’ll get a 1% rate. would love the cash to go towards my vacation next month! 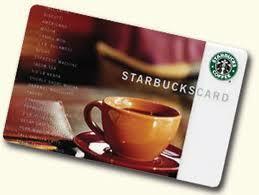 also would love the starbucks card to fulfill my coffee needs! I would pass it on to my daughter in college! She is working and helping to put herself through Nursing School and this would be a great help to her! I tend to save all my rewards points until I have enough to pay the balance on the card in full for an entire month. Sometimes this takes quite a while, but its a huge boost to my monthly budget when I can eliminate an entire monthly bill. I have close to $1000 worth of points on my main card. I’ll coincide cashing that in with my next vacation–basically giving me a free vacation and then some. I’d use that cash back to add to our fund to pay for home selling costs (realtor commissions, etc.). Odd way to look at it, but it is essentially forcing ourselves to save money toward our next home since those costs would come out of the home settlement either way. I belong to several online and credit cash back rewards programs. I use the money I get to pay extra on my mortgage or buy essentials that I need/would buy anyway. It saves me a lot of money (for doing wHat I normally do). Pay off that debt! Thanks.. I would use it to save up for Christmas presents! It would go straight into my college fund ! I would add it to my college fund ! I would use it to build long term savings. I JUST completed getting my $1000 emergency plan done and am working on paying off debt which is under $2000. Going to build that Long Term Savings! Great contest, Pete. Thanks for the reminder. I still have $25 cash back from PerkStreet I need to use. I think I’ll splurge a bit with mine. Maybe put it all on black at the roulette table. all on black, huh? 50/50 chance? Prior to reading today’s blog with the giveaway, I had already signed up for Perkstreet because of an earlier blog you had posted. Does that count for the extra entries? Should I win, I would use the $25 towards Christmas this year. Instead of using our monthly income, which right now is set up to knock out our debt, we are taking extra money from working separate side jobs for Christmas. congrats on the upcoming anniversary! I would save it of course! If I won $10 I’d tithe a buck and put the rest towards my Christmas fund! sandy beaches, here we come? I would save it toward retirement. I would have to seek my husband’s guidance on how to use the 2%, but I would love to put it towards a vacation fund since we had to nix a vacation to make the budget work. Thanks for your helpful counsel! I’d use it to pay cash for wedding expenses while my fiance and I continue to kill the debt beast by paying down, down, DOWN the debts! Thanks! I have a separate savings account for “found” money. That is my vacation money stash. for those little extra treats when on vacation. Paying off my leftover student loans!!! I would use it for an emergency fund. After being laid off last year, I really learned a lesson to save up for several months of income. Id make sure to keep the extra earnings liquid so Id have access to them. I can do that at http://www.smartypig.com where I get 1.75% APR. I would spend it on a vacation with my mom. Our family and friends have been hit hard with the economic downturn. Some of them weren’t doing well even before that. We take very seriously our command to help and support “widows and orphans” and believe that if we don’t, who will… so on our rewards cards now, we take $ and gift cards and distribute them – trying to do so (as much as is possible and allowed) anonymously. If we were to receive these rewards from PerkStreet Finanacial, our philosophy of giving would remain the same… it’s like a gift from God returned to His kingdom work! I would most likely divide the cas back putting half of it in savings and using the other half for fun money with the kids. Like the before noon shows at the movie theater or an ice cream night. Both of which we only use giftcards or unplanned money for. That way I’m building up interest in savings for a house but still having a little fun too. Great give away Pete. My oldest is going to college next year and $600 would go a long way in paying for her books. Thanks for the giveaway! I would use the cash back for a quick weekend trip. wow! Im just using my piggy bank coz i only found coins. Thanks for the offer! I was just looking at this checking account and this blog gave me the shove to get the account opened. My wife and I are on a very tight budget. We normally use credit cards all the time, to get the cash back rewards. We always pay off the cards completely each month so we don’t pay interest charges, but it will be much nicer to just use our checking account and get 2% cash back. Since we are on a really tight buget, I try to find the best cash back rewards program. With the cash back I usually get gift cards for my wife to have special treats, sometimes starbucks for a “tasty coffee beverage” or gap for some new clothes for her or target so she can do some home decorating. Thanks this blog and info on the checking account! I’d would SURELY invest the cash back! this would go towards rent. unfortunately that’s where it goes these days. that and college loans. boo. i would definitely use it towards a vacation…everything else i make goes towards paying off loans! I would put it into my emergency fund – that is currently where I put all my “found” money. I would use my cashbacks to pay for a huge dental bill that my daughter has. She had to have a root canal and a crown and it was over $1300! I can’t afford this and it feels as if I will be making payments forever. She has a new baby and just can’t afford medical or dental at this time in her life so I try to help her out all I can. Previous Post: Is It Harder To Not Fall Prey To Consumerism When You Can Afford It More?